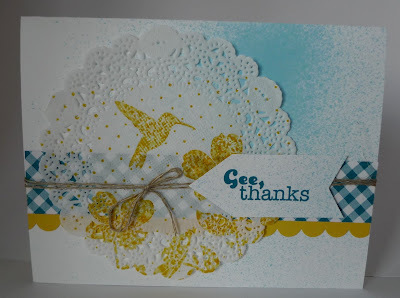 Karina's Kreations: Stampin'Up Wildflower Meadow Sneak Peak! Stampin'Up Wildflower Meadow Sneak Peak! I wanted to show you a cute sneak peak I saw in Fiji. I cased this card and changed the colors. This card uses the new stamp set Wildflower Meadow and Really Good Greetings. You'll be able to order these sets May 31. I stamped the bird in Daffodil Delight ink on the Tea Lace Paper Doilies. Tip: Dry it with your Heat Tool so the ink doesn't run! Do you love the Designer Series Paper? It's called Gingham Garden also available May 31! I used a Stampin Spritzer # 126185 filled with Rubbing alcohol and 10 drops of Island Indigo re-inker to spritz the Whisper White card stock. You're invited to my garage sale on May 31! If you buy a retiring stamp set from my Buy One Get One FREE sale you could get this Designer Series Paper and stamp set for FREE! !